Roger Federer reached his 4th consecutive final (Halle, Wimbledon, Toronoto & Cincinnati) as he schooled Milos Raonic 6-2, 6-3 in an hour and 7 minutes. 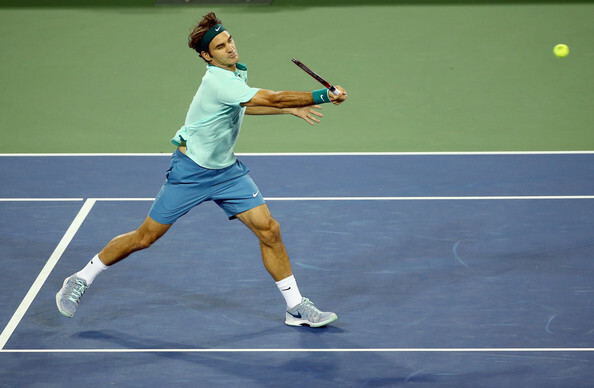 Federer played an almost perfect set as he didn't even lose a single point on his 4 service games and converted both of his break points to break Raonic's service in the 2nd and 8th game to comfortably win the first set 6-2 in 27 minutes. 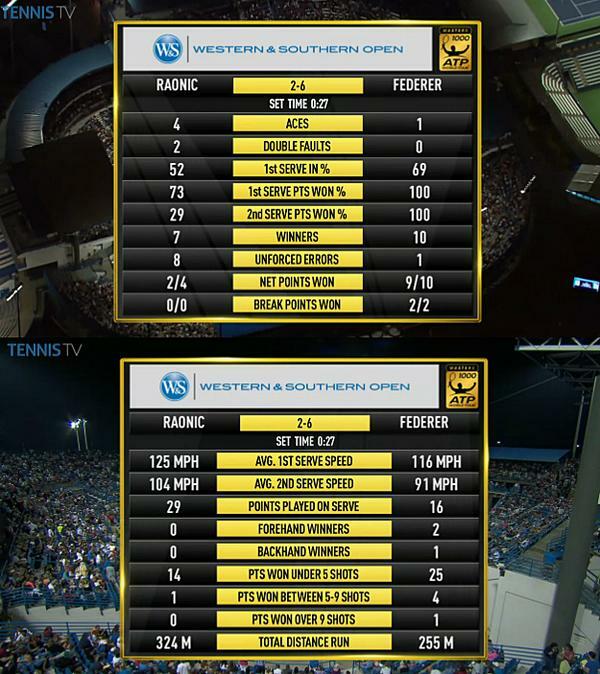 Raonic had a couple of 0-30 leads on Federer's service in the 2nd set, but, Federer managed to hold his service games comfortably & faced just one break point in the opening service game of the 2nd set. 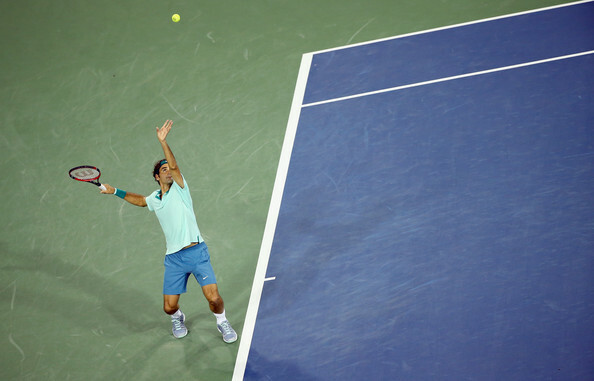 Federer broke the Canadian's service in the 8th game on his 3rd break point and then comfortably served out the match in the 9th game winning the set in 40 minutes. 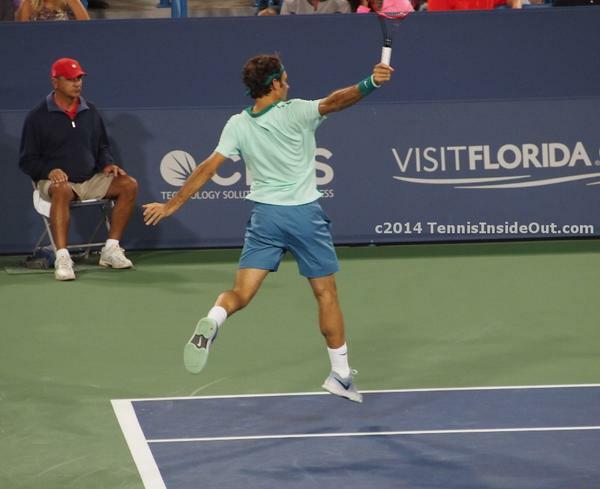 Roger Federer's 971st overall career match win. 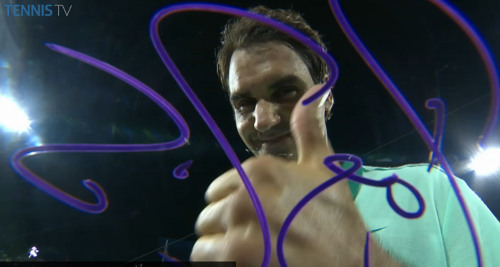 Federer's 303rd match win at an ATP-1000 masters tournament level. 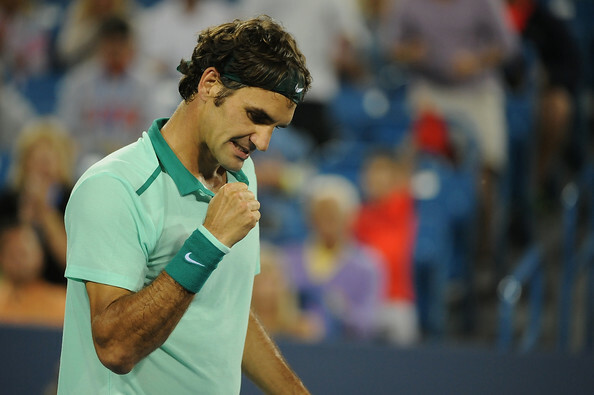 This is the 6th time in 15 appearances at Cincinnati, when Federer has reached final of Cincy Masters. 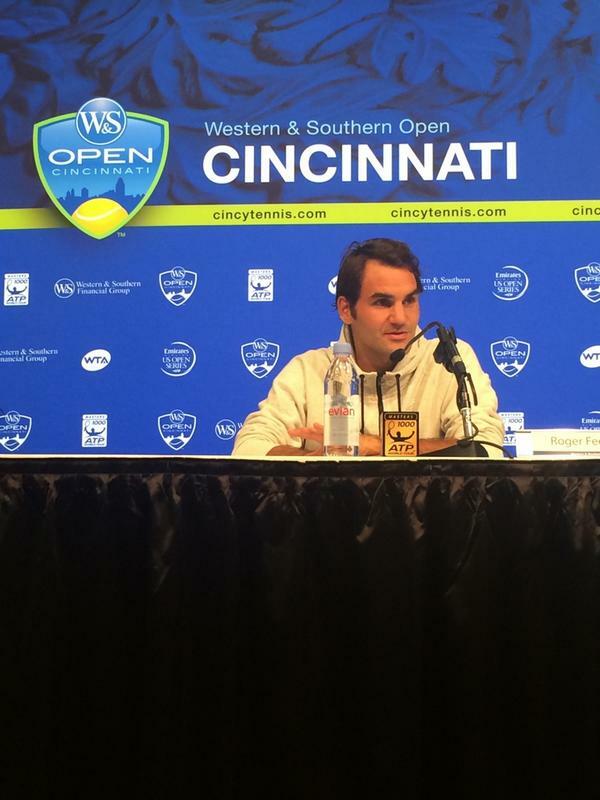 Federer is 5-0 in the finals of Cincinnati. Tomorrow's final vs David Ferrer will be Federer's 38th final appearance in ATP 1000 Masters tournament in 113 appearances. He is 21-16 in finals. The following is the leader-board in terms of Finals at masters : Nadal: 40 in 82, Federer 38 in 113, Djokovic: 29 in 75, Murray: 12 in 74. 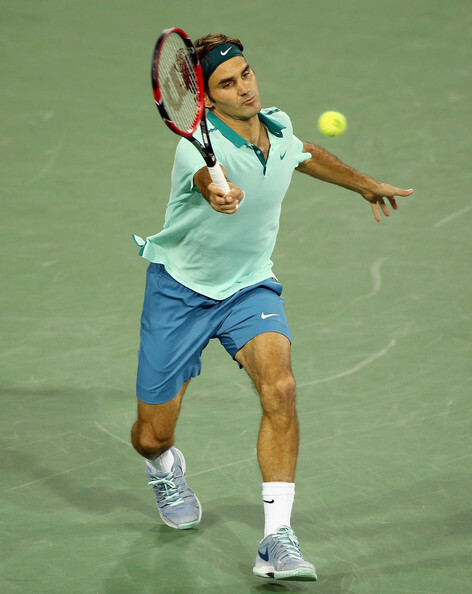 Sunday's final will be Federer's 121st career singles final, he is 79-41 in singles finals till date. Federer's 8th final of 2014. (he is 2-5 in finals in 2014). 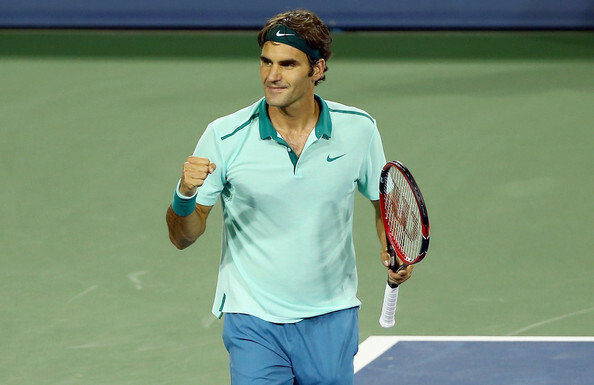 Roger Federer is now 19-1 vs opponents born in 1990's. He has lost only one match vs Federico Delbonis (Hamburg in July, 2013). 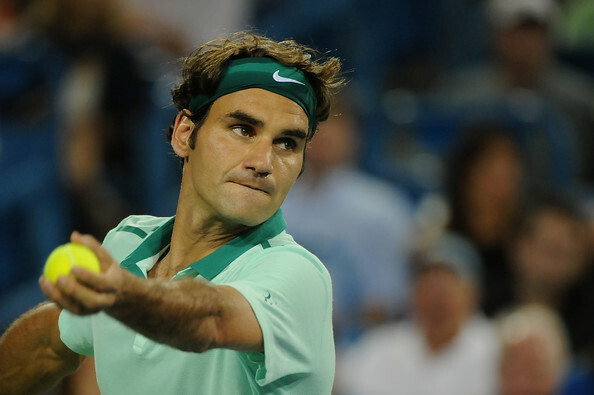 This is Federer's 11th win over a top-10 opponent in 2014, he is 11-4 vs Top 12 opponents in 2014. 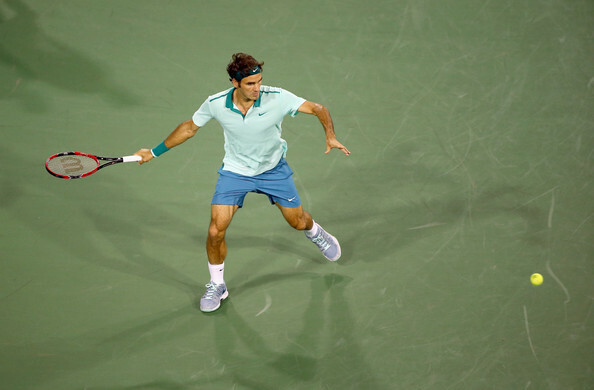 This is the 7th year where Federer has reached 4 consecutive finals. 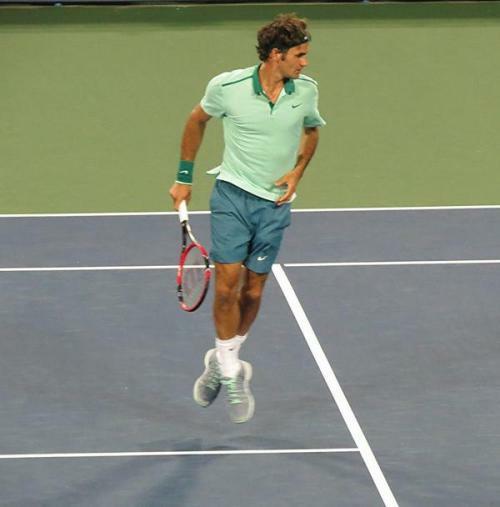 2004, 2005: RF reached 6 consecutive finals twice, 2006: 11 consecutive finals, 2007: 7, 2008: 6, 2012 & 2014. 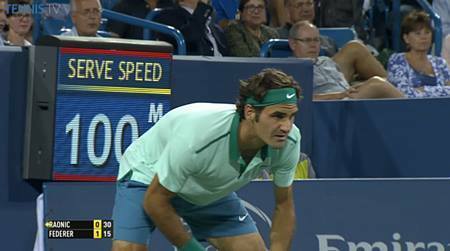 Federer leads the head to head 15-0 vs David Ferrer. 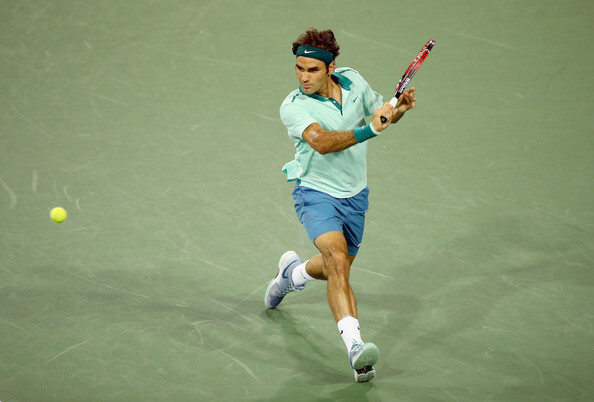 Federer's 15 match winning streak is one of the Top 5 active winning streaks in the ATP Open Era history. I was slightly doubtful about this match. 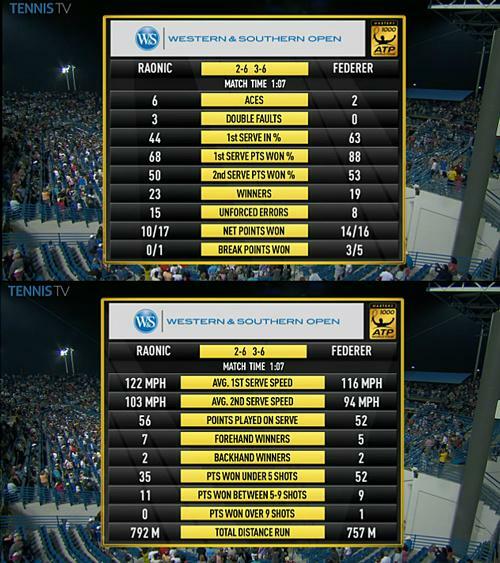 Somehow Raonic is impressive. 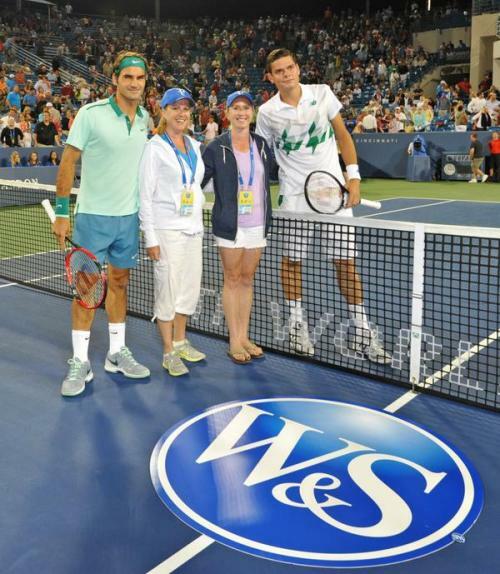 Him, his serves and presents himself as a dominant figure, but with players confronted with unrealistic schedules ( Wendy's tweet) I thought Roger might be tired. 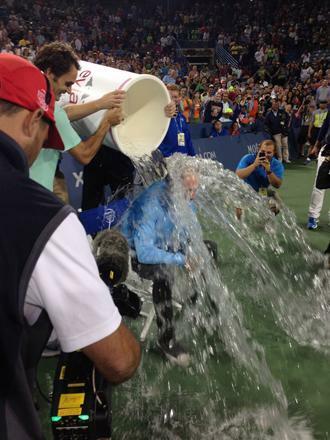 BUT woke up this morning to read tremendous news of his win vs Raonic. 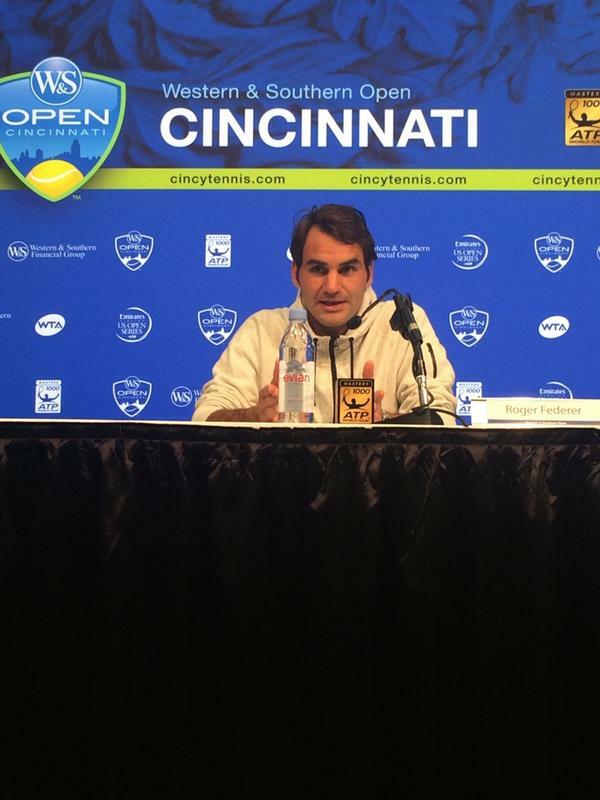 Certainly will watch final against David Ferrer and fingers crossed for Roger as Winner for the 6th time (am I right in saying already won Cincinnati 5 times already)? Sending positive vibes to him. Certainly appreciate videos, etc. especially when not seen matches. Thanks to all. 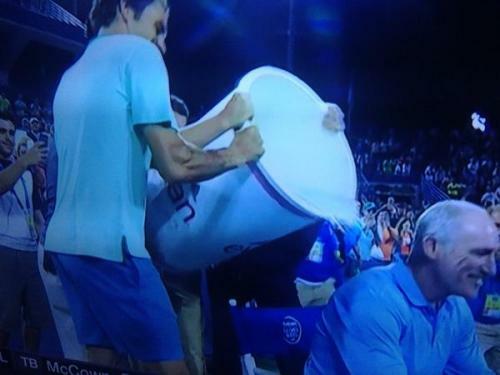 Good luck Roger. With the preceding women's match going the distance, it meant the start of this one was pushed back an hour, making it an even tighter change over for winner playing in the Final tomorrow afternoon. This was mentioned on Twitter last night and it was suggested that it would surely be better if the women's matches were played on a different court so that the men could play their matches at a more reasonable time. In fact it would suit all the players better I would have thought. 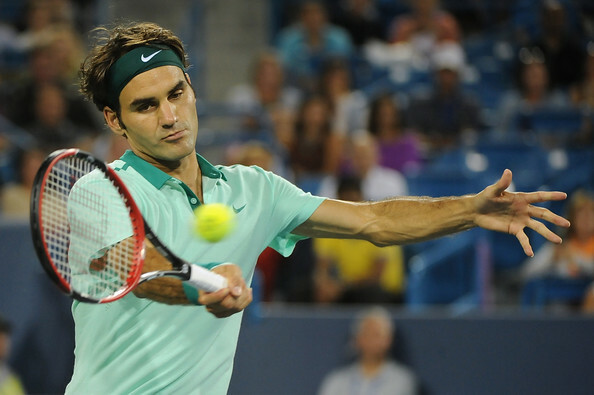 Back to this match ... Roger Federer has certainly improved each time he has stepped onto the court in Cincinnati and this was no exception. What a cool, clinical masterclass this was! It may have been a different story if Milos had improved on his service % but Roger's ability to handle the returns was one of the strong points of his game. His movement around the court was balletic! All in all a well deserved victory for Roger Federer and lets hope he can keep this momentum going for the final tonight! Hey just to correct you nadal is 18-3 vs berdych. Berdych led the h2h 3-1 at one point. In my post, I am talking of consecutive (active) winning streak & not head to head. Schooled him! 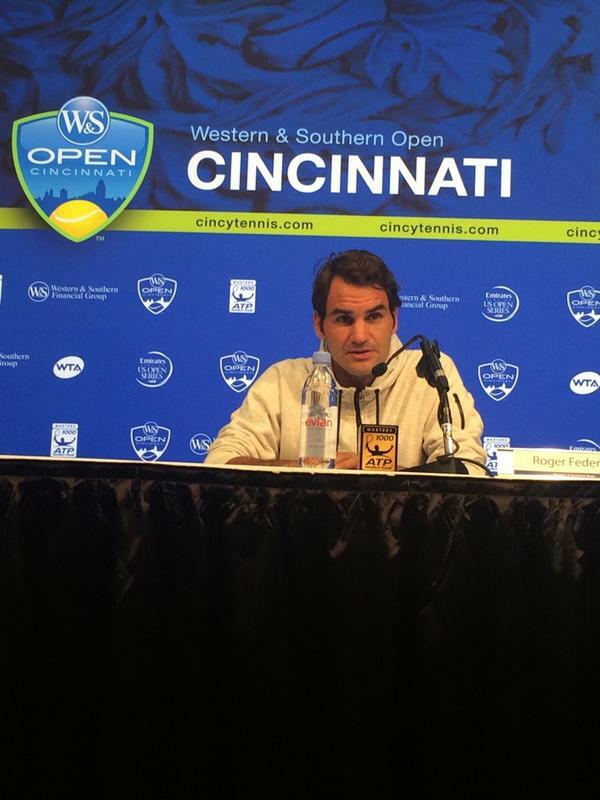 Worried about how tired he will be and how rested Ferrer will be. Luckily Ferrer doesn't really hv fire power but he will very up for this. However, can't see Fed losing another final. Edberg would not tolerate it!! !